I write but I'm not a good writer. I get used of my freaky imagination (when I'm in the mood) to write dark fiction stories. I have not finished my novel yet, revising, polishing, and of thinking new characters for the next chapters. 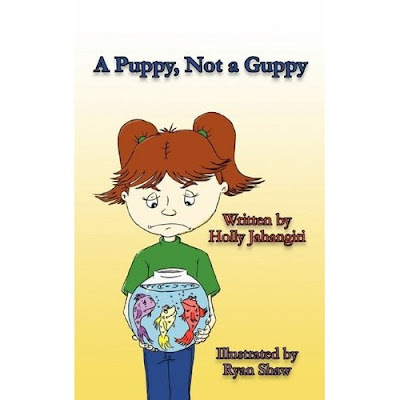 But for now, let us talk about Ms. Holly Jahangiri's "A Puppy, Not a Guppy". "Irma wanted a puppy, a pet she could take on walks, not a few stupid guppies. Fish don't do anything, except roll over on their backs if they die. Sometimes, though, a girl has to make the most of what she has. Now, what can Irma do with three guppies besides stare at them as they stare at her?" Irma do really loves puppies so much. Teach them with tricks, play with them, a good friend and let's say cute and smart little girl. She's in the fourth grade level now and guess what, she loves Mathematics and Science (me too!). That is why when she grow up, she wants to be a good veterinarian and kidding aside (but I think she's serious) inventing a time machine. Indeed that is a huge dream. The book is definitely a worth paying for. You and your children, beyond doubt, will enjoy Irma and her wonderful guppies' short story. And of course, there are lessons to learn from the book. Here's a sample excerpt from the book to tease you. “No puppy,” said Mom and Dad in unison. Read more here and visit Imaginary Friends "Children's Books by Holly Jahangiri". Exciting Part: Win an autographed copy of "A Puppy, Not a Guppy"
1. A link back to one or more of the other blogs that Irma and her Guppies have visited. 5. Answer to the question: What kind of pet do you like best, and why? Each activity equals one (1) entry, and you may do each activity once for a possible maximum of six (6) entries per valid email address. Your comment must be entered using a valid email address so that you can be contacted for mailing info if you win! Entries that do not have a valid email address will be considered null and void. Duration: Contest begins at 12:01 AM on December 9, 2009 and ends at 11:59 PM on December 15, 2009. Winners will be drawn on December 16, 2009. Eligibility: Contest is open to anyone age 13 or older. Tour hosts are eligible to enter. Winners: Two winners will be randomly chosen (numbered in the order in which they are received, with the winning number chosen at http://www.random.org/ ) from all qualifying entries, and will be required to provide a physical mailing address in order to collect the prize (one free book). Only one entrant per household is eligible to win. If a second entrant from a single household is chosen, another name will be drawn until all prizes are awarded. Be sure to visit all great bloggers who are helping to make A Puppy, Not a Guppy tour such a fun full and successful tour! So what are you waiting for! Purchase your copy now on Amazon! This is great! I found it, you know. I told Miss Holly about it. She was stunned. She said "Hey, that's not on the official calendar!" She seemed pretty happy about it, though. Oh, if you want to officially enter the contest, read carefully (my mom's always telling me that, 'cause I always skip something when I'm reading instructions - once I left the baking soda out of the cookies, and they didn't turn out so great). You have to come to my blog and post a comment and say which of those six thingies you did. Don't forget, okay? @kate2world: I know she will. :D Irma is a smart girl like her mom and her story was really full of fun even though I don't know the whole story, all reviews I've read was great and her guppies as well. A Puppy, Not a Guppy would certainly love by children of all races. A warm welcome from the kompyuter sayantist. Salamat! @Irma: Thanks Irma! 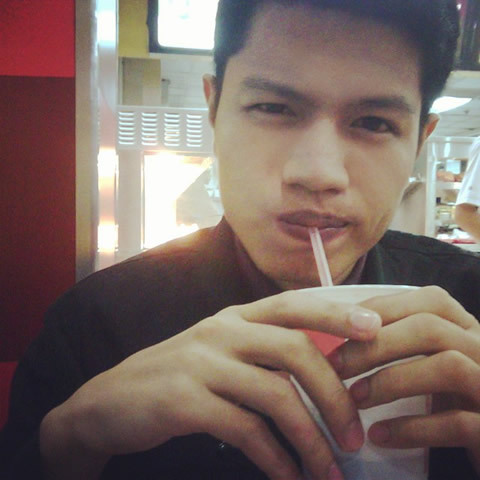 I am glad to have you here and spreading your happy story was really a worth for me. And oops, I skipped something important, let me check on that. It's great that you've remind me about it. What about your guppies? I hope they're in the good mood to play with you. Hope they're all find. Till there, see ya next time. *@kate2world "Salamat" means Thank You here in the Philippines. Stay in touch! Oh, wonderful, another blog about A Puppy, Not a Guppy, Holly, Irma, and illustrator Ryan Shaw. I'm always glad to see more about this fun book. A Puppy, Not a Guppy virtual book tour was really a successful tour here in the cyberspace (although not done yet). I am glad to be part of it though it's not official but then Irma and Holly likes it. Nice of you to drop by my blog, You may want to participate in my contest too. Good luck. @Jena Isle: Great! Accepting your invitation to participate, deal. Wonderful book for my children! Mamahalin siya ng aking mga anak lalo na sa kanyang mga guppies. @Holly Jahangiri: Wonderful and well said. They will 'finitely enjoy all Irma and her guppies' tour and of course exciting detours - here on my blog. Thank you! @Judie: Buy one, it is really a worthy and highly recommended book for your children. Check Ms. Holly Jahangiri's site http://jahangiri.us/books (Imaginary Friends), for sure you will be convince. Hey, Irma is really going places, way to go! @Zorlone: She really wants to conquer the blogosphere. Irma did not stop going places and she was having fun full virtual tour. And thank you Doc for coming here.. Plenty of time to research NaNoWriMo, Japaul - it's an annual November tradition on the Internet, now. National Novel Writing Month. Never mind the "National" part - the thing went "international" years ago. National now means you can clock it by your local time zone, I think. To "win" (and the only prize is satisfaction) means to write a novel, start to finish, of at least 50,000 words, during the month of November. You may plan and outline before November, but you may not write down any of the story before 12:01 AM on November 1. The idea is to write fast and ignore the internal critic/editor until at least December. @Holly: NaNoWriMo is cool! I visited the site already, sOooo many activities up for grab and haven't seen it early, er. I'll try maybe next year. It would be great to contribute and I want my works be publish too.